Emil Carlsen : House in the trees, ca.1928. Signed: Wortsman Rowe sticker on back. 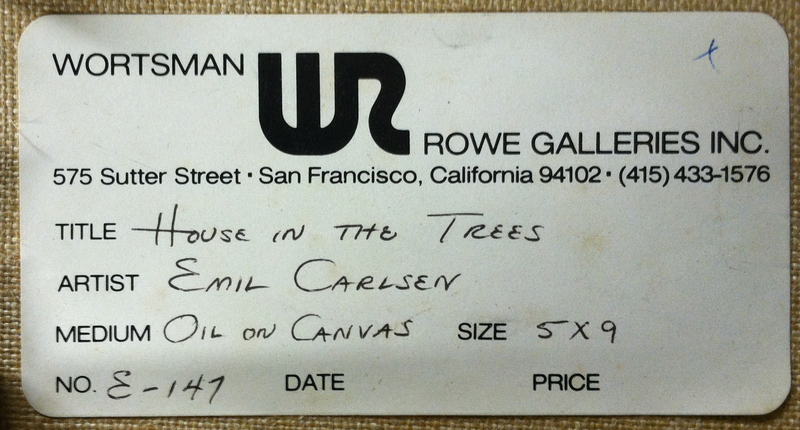 1975 Wortsman Rowe Galleries, San Francisco, CA, “The Art of Emil Carlsen: 1853-1932?, January 10-February 21; Rubicon Gallery, Los Altos, CA, January 17-February 28; The El Paso Museum of Art, El Paso, TX, March 2-March 30; Robert Rice Gallery, Houston, TX, April 10-May; Coe Kerr Gallery, New York, NY, June-July; The Fine Arts Gallery of San Diego, San Diego, CA, August 20-October 10; The Norton Gallery of Art, West Palm Beach, FL, November-December. – Contacted by new owner Brian Bain for confirmation of worth and authentication. – Rubicon-Wortsman Pub., San Francisco, CA, Exhibition Catalog, ”Art of Emil Carlsen: 1853-1932”, 1975, #147, not illustrated.